Rising early in the morning before sunrise and driving in a 4 x 4 on dirt roads through farmlands full of cattle close to one of the largest rain forest reservations in Venezuela. A truly gorgeous unspoiled area…full of flora and fauna within driving distance of other spectacular natural places. Hike through farms full of cattle, across marshes and into canopy rain forest in search of the largest raptor in the world – the Harpy Eagle. High in the trees above is a giant nest with a young Harpy laying guard to it and calling to its mother for more food! In she glides with something hanging from her claws which the youngster promptly dispatches. Depending upon the time you have we may visit two exciting sites one of which a BBC documentary team spent six months or more filming a family of Harpies. Angel-Eco Tours will not reveal the exact location on our web site, only our customers will have the privilege of knowing the exact location. As our mission explains we are concerned with conservation and preservation so we are very guarded with providing too much information at the outset in order that this location does not to become too popular and of course more importantly to maintain the privacy of the Harpy’s nesting place. We believe this makes this side-tour even that more special! Angel-Eco’s staff will take you to this “sleepy hollow” by overland transport and be your guide’s for the next one or two days depending upon your personal timing. Our guide may not speak English, in fact, we have difficulty understanding his Spanish, but he is an expert birder. He will point out more than just the Harpy; this rural area of Venezuela is simply full of birds and other wildlife. As with many of our special tours this is a stand-alone experience and few people will ever be lucky enough to see this majestic eagle in the wild, let alone on television!!! Combine this exciting wildlife tour extension with the Orinoco Delta, La Cueva del Guácharo, and Los Llanos for more days of full on wildlife and amazing nature experiences. In fact it’s a great side trip to compliment many of our programs. 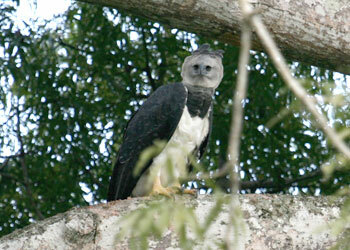 Check with Angel-Eco's staff to ensure that the Harpy Eagle's are nesting. Can be coordinated with other tours in the area. 3 days / 2 nights suggested from Ciudad Bolivar, Puerto Ordaz (closest airports). Comfortable posada - good food!